When considering solid hardwood floors, Virginia Vintage hardwoods are a great choice. The company recently released a new French Quarter style and after review it is a definite flooring choice worth your notice. The French Quarter line offers three styles – Bourbon Street, Esplanade Avenue, and Royal Street and they vary in color but all are a warm selection going from red hues to honey with a sweet chocolate brown in between. These tones work with the subtle scraping and wire brush work to highlight the hardwood texture and grain in each plank. 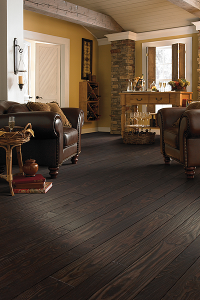 The planks measure 3 1/8″ and 5 1/8″ in width and have a thickness of 3/4″. To make it very easy for the customer the French Quarter planks are packaged together, both widths, so there is no need to calculate how much of each width you would need. This solid wood floor has European design mixed with a rustic, southern charm and with proper care should last for years in your home. The flooring does come with a 50 year warranty. Always be sure to check with the manufacturer on specifics regarding the warranty, for example it is not recommended that this floor be used with radiant heat. 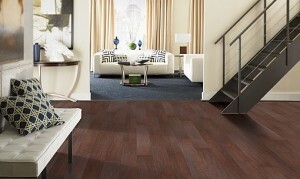 To see the whole French Quarter line and all the Virginia Vintage flooring options visit www.carpet-wholesale.com.